This workshop is being hosted by one of my favorite places in Southwest France. Le Vieux Couvent. I hope you will join me on this fun workshop. 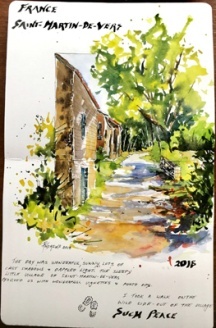 Nestled in the village of Frayssinet in Southwest France, the painting opportunities abound. It’s quiet and charming, just the place to park your easels. Old medieval towns, villages, rivers, castles, and superb fields of flowers await artists and photographers alike. This workshop is for those artists needing a ‘nudge’ with their art. Sometimes we get into the doldrums and our work shows it. Sound familiar? Don’t allow your personal statement to be the same as every other artist. Do you lean toward the graphic approach, or maybe color is your thing; maybe it’s a love of dynamic composition? Your ‘STATEMENT’ needs to surprise the senses of your viewers. 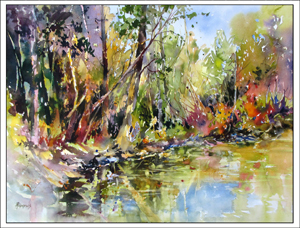 Rae works in a very loose and impressionistic way, and likes to explore the many nuances to make her paintings different; playing with COLOR , VALUE, MOVEMENT and DESIGN. 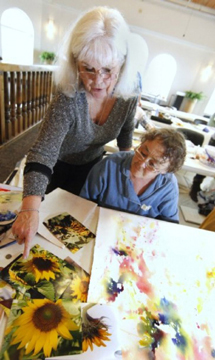 This workshop is designed to accommodate all levels of expertise, whether an experienced or novice painter. 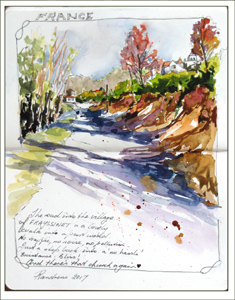 Students are encouraged to work in their preferred medium; pastels, oils, acrylics, or if you may prefer more personal journal entries in watercolor and/or gouache. As Rae works in all mediums, students are guaranteed personal one on one ‘at easel’ guidance in whatever they use. 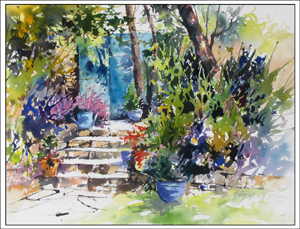 ** Rae will mainly demonstrate in watercolor, and how she approaches her travel journals ; as well as larger format watercolors. As she also paints and teaches in all mediums, she encourages students to bring whichever medium they love, and she will provide ‘at easel ‘ personal instruction to those students not painting in watercolor..
Don’t miss this great opportunity to stay in a 17th century refurbished convent. Gardens, and vignettes to paint everywhere. Quiet, relaxing and just the most superb venue at which to paint. 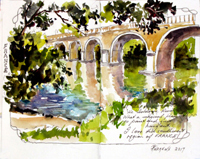 We travel the Dordogne region in air conditioned vans, for our chosen painting sites, such as peaceful riverbanks, lakes, wineries, and much, much more. There is a full studio at the convent for your leisure as well, which is open 24/7. Not to mention a swimming poolfor the exercise oriented. We are all royally looked after. A taste of yourvisit to Le Vieux Couvent. For more information visit Rae Andrew’s website at www.raeandrews.com, or blog page at raeandrewsgallery.blogspot.com.